Located on the banks of the Amstel and Schinkel rivers and the IJ bay, Amsterdam is the capital city and most populous city of the Netherlands. As of 2006, Amsterdam 743,027, with 1,021,870 people living in the metropolitan area. There are many places to see in Amsterdam, but perhaps the most moving place to visit is 263 Prinsengracht, and the museum at 265 to 267 Prinsengracht, better known as the "Anne Frank House". This is where the Jewish diarist, Anne Frankhid with her family and four friends to escape Nazi persecution between 1942 and 1944, during the German occupation of the Netherlands. Sadly after two years in hiding, the group was betrayed, and taken to concentration camps, where all died with the exception of Anne Frank's father, Otto Frank. There are a number of other museums in Amsterdam that you will want to see including the Rijksmuseum (arts, crafts and history), the Stedelijk Museum (modern art), and the Rembrandt House Museum (Dutch: Museum het Rembrandthuis), which is the house where the famous painter, Rembrandt Harmenszoon van Rijn, usually simply known as "Rembrandt", lived and worked for a number of years. 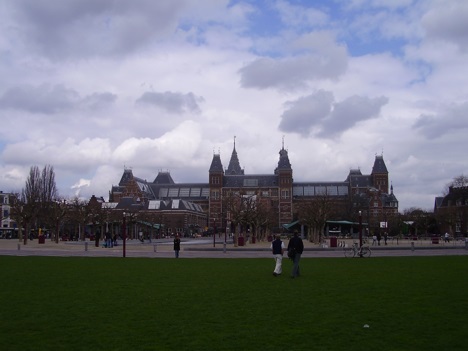 You will also surely want to visit the Van Gogh Museum, a museum dedicated to the 19th century Dutch painter, Vincent van Gogh (and his artistic contemporaries), which has the largest collection of van Gogh's paintings and drawings in the world. Lightweight yet packed with valuable insight into Amsterdam's history and culture, Rick Steves Pocket Amsterdam truly is a tour guide in your pocket. Lonely Planet Amsterdam is your passport to the most relevant, up-to-date advice on what to see and skip, and what hidden discoveries await you. Soak up centuries of artistic masterpieces, cycle through the city’s canal-woven core, and get gezellig in a brown cafe – all with your trusted travel companion. Get to the heart of Amsterdam and begin your journey now! Looking for just the highlights of Amsterdam? Pocket Amsterdam is our handy-sized guide featuring the best sights and experiences for a short break or weekend away. Want more extensive coverage? Check out Lonely Planet’s The Netherlands guide. In this effortlessly erudite account, Russell Shorto traces the idiosyncratic evolution of Amsterdam, showing how such disparate elements as herring anatomy, naked Anabaptists parading through the streets, and an intimate gathering in a sixteenth-century wine-tasting room had a profound effect on Dutch-and world-history. Weaving in his own experiences of his adopted home, Shorto provides an ever-surprising, intellectually engaging story of Amsterdam. Updated for 2018. Compact and affordable, Fodor's Amsterdam 25 Best is a great travel companion for travelers who want a light, easy-to-pack guidebook to one of Europe's most exciting cities. DISCERNING RECOMMENDATIONS: Fodor's Amsterdam 25 Best offers savvy advice and recommendations from local writers to help travelers make the most of their visit, providing great places to shop, eat, sleep, and drink for every budget. GORGEOUS PHOTOS AND MAPS: Full-color pictures and full-size street maps cover the best Amsterdam has to offer, all in an easy-to-use package. INDISPENSABLE TRIP-PLANNING TOOLS: Save time and space by having Amsterdam's top 25 sights and experiences in one convenient guidebook. Neighborhood walks show off the best of the city with self-guided tour ideas. Plan excursions outside the city with the Farther Afield section. PRACTICAL TIPS AND PHRASES: Travel like a local with our Need to Know section, filled with useful travel tips and essential Dutch phrases. COVERS: Anne Frankhuis, Museum Het Rembrandthuis, Rijksmuseum, Van Gogh Museum, Singel canal.